Picture this. 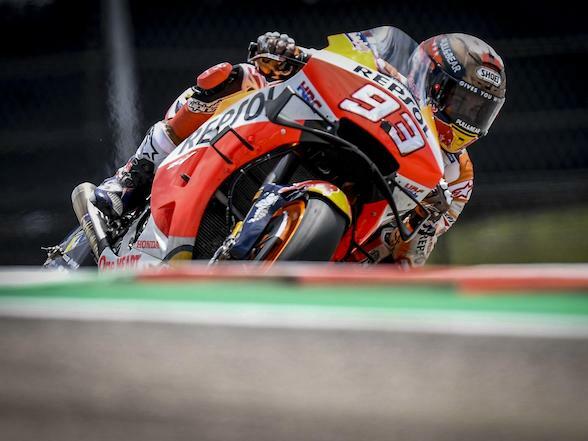 It’s Christmas Day in 1987 and Ronald Reagan is entering his last year as president of the USA while Belinda Carlisle dukes it out with Pet Shop Boys at the top of the British Hit Parade and Wayne Gardner celebrates winning the 500cc motorcycle GP world championship. At around 07h45 on this fine sunny morning traffic on the N3 highway near Alberton between Heidelberg and Johannesburg is minimal, but the tranquillity is abruptly disturbed by a fast-approaching high-pitched wail. As the sound gets louder and closer people in nearby houses stop unwrapping their presents and rush out onto their verandahs. Whatever could it be? All of a sudden there’s an almighty bang followed by a series of lesser explosions accompanied by a tremendous spluttering, rattling and clattering, and a spectacular roiling cloud of dense blue smoke erupts on the freeway, expanding by the length of a rugby field every second. Some witnesses doubtless find it reminiscent of the TV footage of the Space Shuttle Challenger explosion on take-off just four years earlier. Other older folk possibly cast their thoughts back to the horrors of WW11. As silence falls cars lurch slowly from the oily pall of smoke with their headlights on, shell-shocked drivers clutching their steering wheels with shaking white knuckles. Fourie in the 80’s with daughter Michelle and son Donovan when he was still good looking. “I was doing about 11 000 rpm or something when the engine blew up,” says ever-cheerful Bike SA publisher (now owner of Hartbeespoort holiday resort and organiser of the Rhino, Impala and Paradise rallies – ed) Simon Fourie 28 years after his three Durban – Johannesburg speed record attempts. “It dropped a valve and that destroyed the whole motor. The pistons, rings, valves, oil and just about everything else escaped through the exhaust pipe. The bike lost all power but kept going for maybe half a kilometre with all those atomised bits of pistons and things going out of the exhaust. It looked like an atom bomb had gone off behind me. 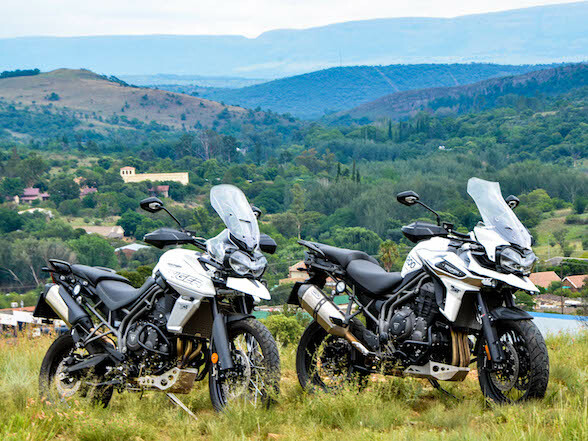 People were coming out of their houses and looking up at the sky to see what had happened.” And so ended Simon’s first try at riding a motorcycle from Durban to Johannesburg in under three hours. It was to take another two attempts spread over the next few weeks for him to finally achieve his goal, but Simon persevered. 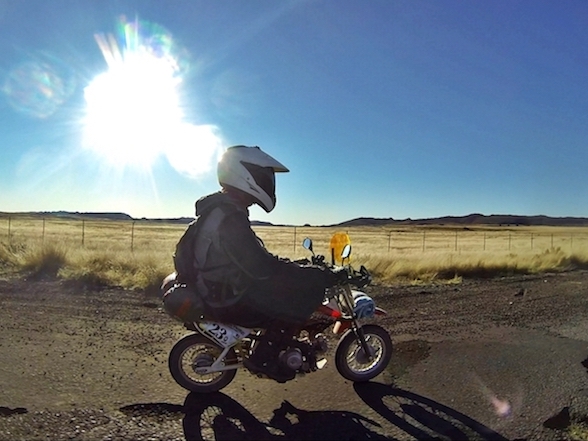 “Those days I think it cost about R12 000 for a new engine, but hey, we were making history here!” The second attempt a week later with a less aggressively-modified engine failed because of a slipping clutch in the middle of the Free State, but the third worked out – almost – perfectly. Simon Fourie in his pre-beard days, probably in the early 70’s. So why would anybody feel the need to pursue such a risky undertaking? For Simon, the answer is simple. He wanted to halt all debate as to whether it could or could not be done. He is, after all, the same fellow who in 1976 entered the exceptionally tough Roof of Africa Rally on a Honda 750 Four road machine shod with knobbly tyres after he got sick and tired of hearing enduro racers banging on about how good a dirt bike and its rider had to be to even contemplate entering the race. ”I’d heard too many people bragging about how quickly they’d done the run between Joburg and Durban – one guy boasted that he’d done it in 3 ¼ hours, but not from city centre to city centre. 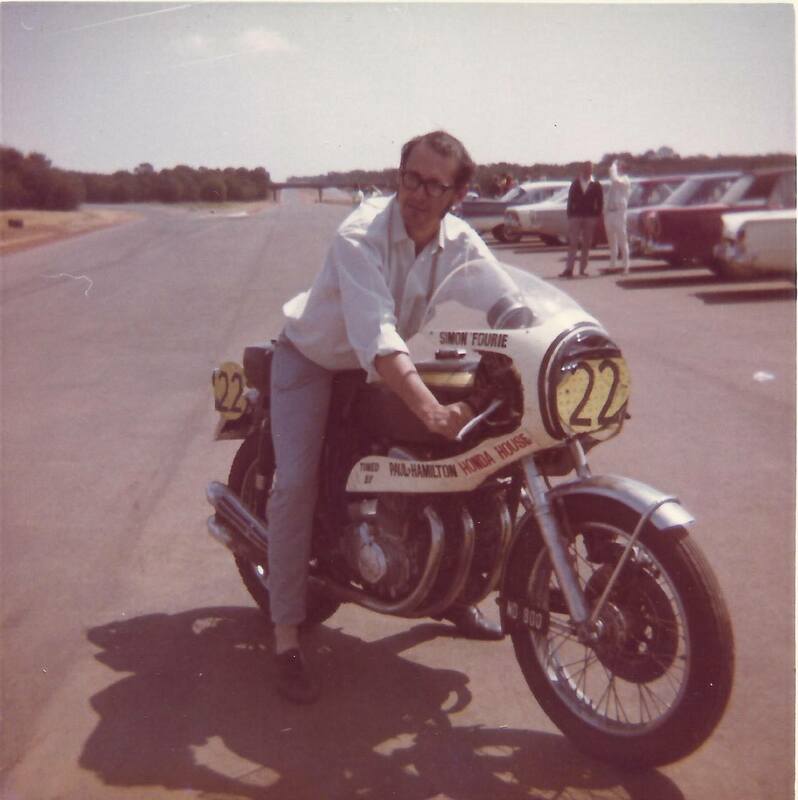 I wanted to shut them up and settle the matter once and for all.” Simon approached legendary motorcycle tuner Piet van Zyl, a.k.a. 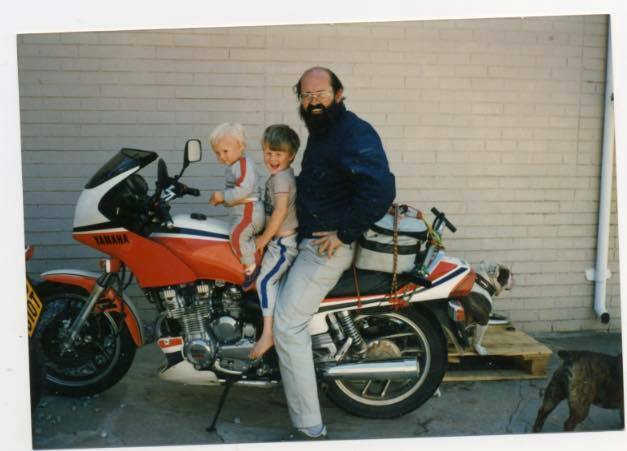 Piet Spoed of Speedbike in Klerksdorp, to supply the bike and sponsor the ride, and was thrilled to be handed a pre-slingshot Suzuki GSX1100R bored out by 1 mm, with a worked cylinder head, degreed camshafts, 36mm flat-side Mikuni carburettors with no airbox, and a Vance & Hines exhaust system, dyno-tuned to give a solid 164 hp on the dyno compared with the standard bike’s 121. 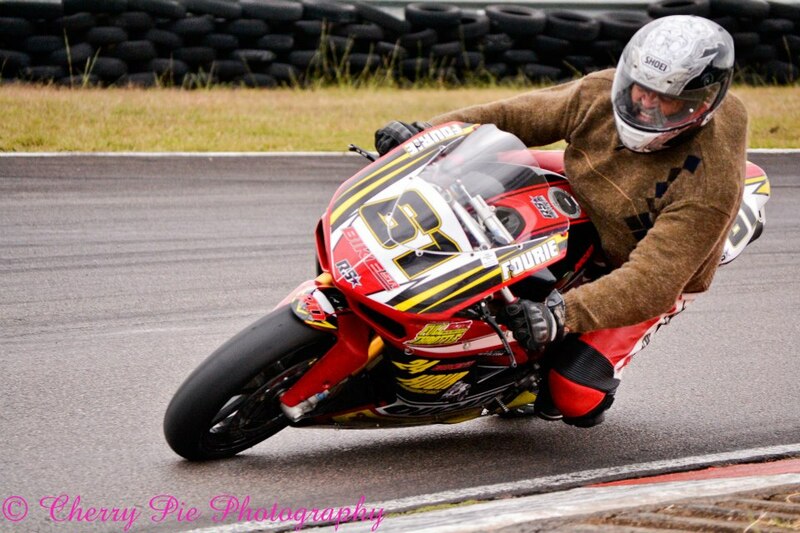 Top speed was a genuine 280 km/h at the 10 000 rpm red line imposed by Piet, who was obviously not as confident as Simon about his friend’s chances of surviving the ride – he took out R300 000 life insurance cover on his rider, just in case…. With the Road Runners in the 60’s. “I started from Durban each time at about 05h00 so I’d have the sun behind me all the way, and did it over the Christmas period because I thought the cops might be in a more forgiving frame of mind if they caught me – hopefully I’d go to jail for two years instead of six. We kept it very quiet beforehand, though, so nobody could set up a speed trap and ambush me.” As an insurance, he also carried R3 000 (about R25 000 today) in cash for bail and fines. In those days there were few toll roads, so Simon had to scythe his way through numerous towns on his high-speed 614 km adventure at an average rate of 205 km/h for the trip, including fuel stops. 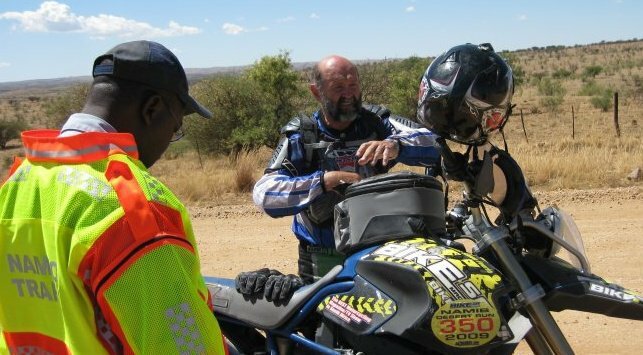 He’d arranged for Pastor Rene Changuion and members of his Christian Motorcycle Association, armed with synchronised watches, to witness his departure from Durban and arrival in Johannesburg’s CBD, and he had teams of helpers waiting at designated refuelling points along the way. Piet was probably a bit cheesed off with the mechanical mayhem wreaked on his bike, though, because Simon borrowed another from a friend, Mike Whitfield, for the final attempt. This was tuned for 141 horses and a 260 km/h genuine top speed – probably about 285 on the speedometer. 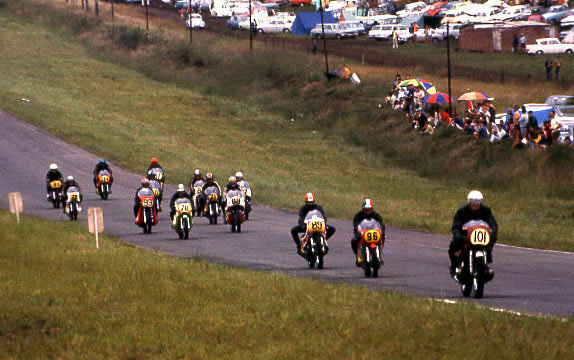 This photo shows him (101) racing at Roy Hesketh in Pietermaritzburg, near Durban. 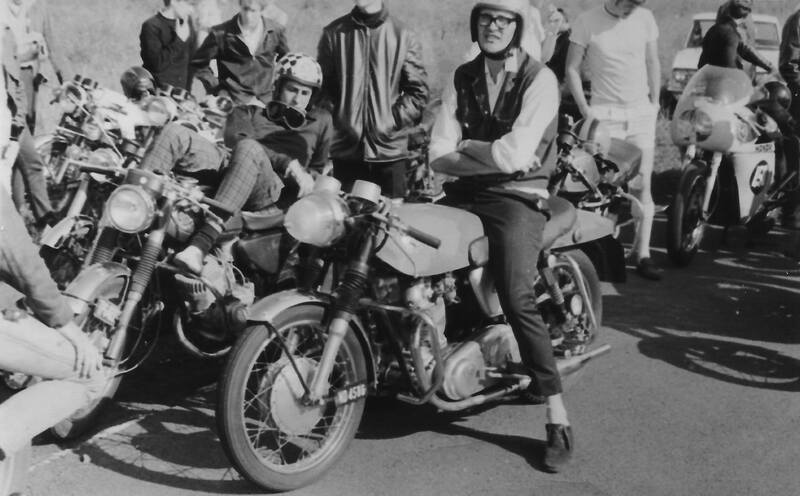 Behind him is Agostini and other Grand Prix notables. While they had to push start, he used the electric starter on his CB750 to get ahead. His lead lasted until the first corer, which he overshot. “The freeway only went as far as Estcourt, where I had to take to the old road through Colenso and Ladysmith,” Simon recalls. “I cruised as fast as I could, which was flat out. On those country roads if you hit a bump at 280 km/h the front wheel comes up easily, but once I got used to that it was fun. If you slow down to 220 or so it takes a long time to get back to top speed. When I had to pass a car it was handy if there was another one coming the other way,” he reminisces. “I knew that they could see each other so neither was likely to suddenly turn across the road in front of me and I could take the gap. You can’t slow down every time you come up behind a car when you’re trying to set a record. There were also tractors and a few other things on the road, so it all got a bit nerve-wracking”. Simon has a quaintly ambivalent attitude towards road safety. 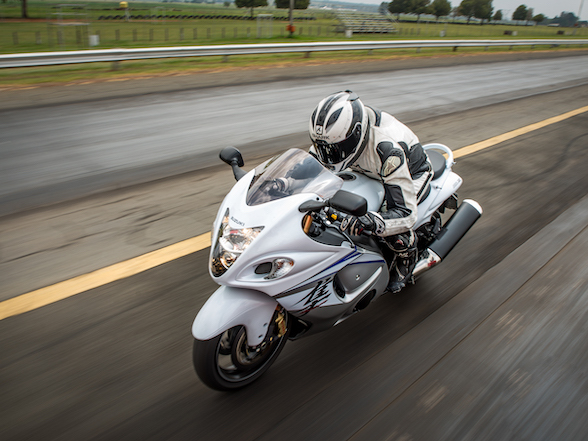 “I used a pre-slingshot GSX-R1100 because it had an 18” front wheel,” he says earnestly. “Most other bikes had 17” rims and if you ran off the road into rocks and things they wobbled quite a lot. The bigger the wheel, the better for stability”. Not in any unplanned transition from tar to dirt at 280 km/h, Simon! 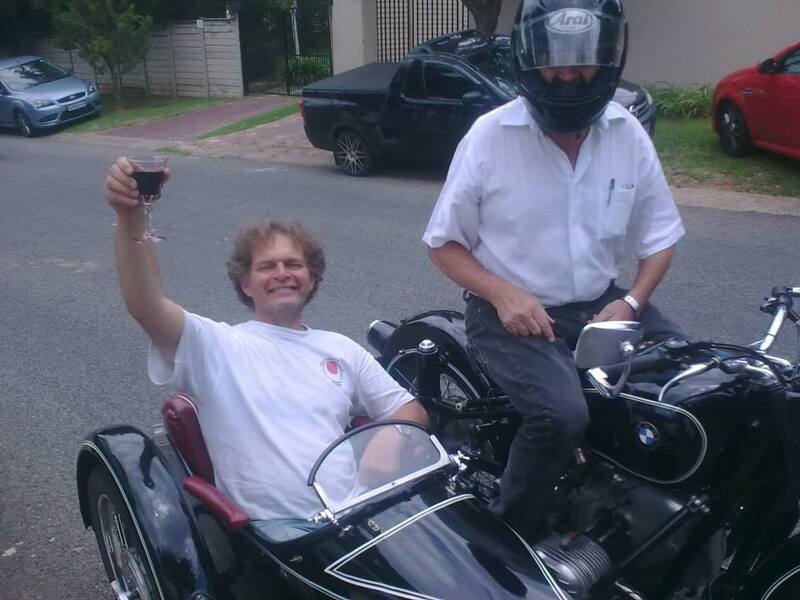 Fourie giving a lift in a sidecar to old friend and biking tale teller Charley Cooper. 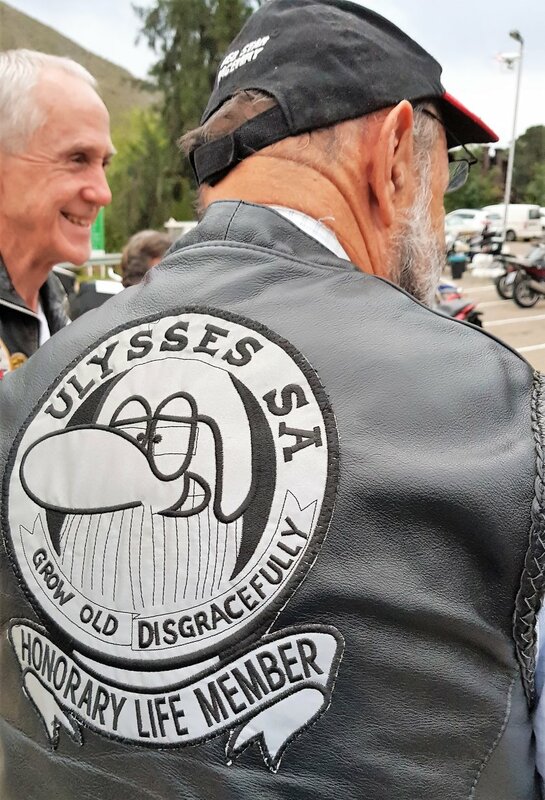 Fourie founded Ulysses in South Africa and lives by their motto – grow old disgracefully. 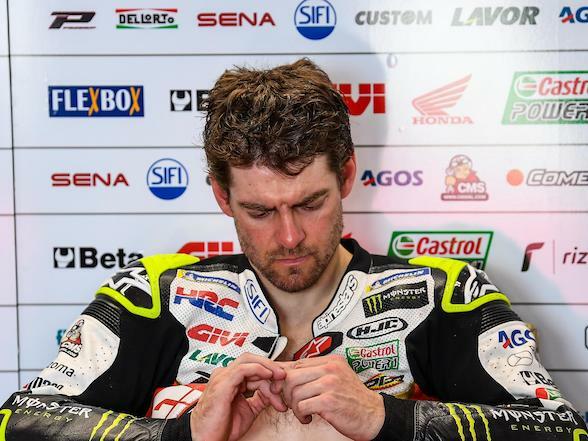 This race was held mid-winter, and the Dainese leathers were not providing adequate warmth, so Fourie found a suitable addition. The police always kept an eye on him. Here, during an Easter Namib Desert Run, he is having a word with the Namib police. There was a slight legal speedbump right in the middle of all this. “A Major General or whatever they called them in the police force in those days rang me and said he was getting so many phone calls complaining about my behaviour that he simply had to open a docket. He asked me to come in to make a statement so he could truthfully say he’d opened the docket, and then he’d quietly close it once the fuss died down. I hadn’t been caught and there was no evidence so they couldn’t charge me, and the fact that there were traffic laws from three provinces involved complicated things. When I asked him where we should meet he told me to come to the 8th floor of John Vorster Square.” John Vorster Square was the notorious headquarters of the Security Branch in Apartheid South Africa, where numerous political prisoners were alleged to have mysteriously “committed suicide” by squeezing through upper story window bars and jumping to their deaths. “I told him I hoped that he wasn’t going to throw me out the window, and he was horrified. ‘No, no no!’ he replied. ‘I’ll personally come and fetch you downstairs and I’ll make sure you suffer no harm.” Simon went along to see the policeman who did just as he’d promised. Simon Fourie, now 71, is still publisher and editor of Bike SA. 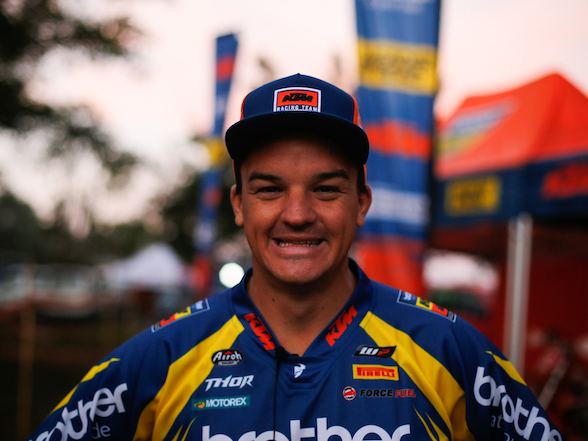 He still also races motorcycles occasionally, usually a Kawasaki ZX-10R in the breakfast-run class where he often finishes in the top ten, and he rides from Durban to Johannesburg on a 1936 BMW in the DJ Rally every year. It takes him two days rather than three hours now, mainly because there’s a compulsory overnight stop. Left to his own devices he’d probably be there before lunch on the first day. 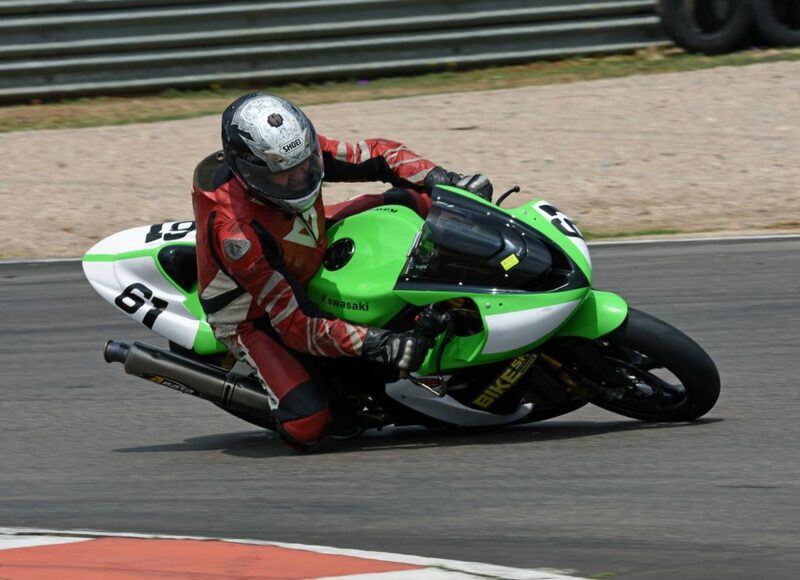 At 71 years-old and still racing his Kawasaki ZX-10R. American Chuck Palahniuk, author of The Fight Club once famously wrote that “All God does is watch us and kill us when we get boring. We must never, ever be boring.” Simon must have read that at school.